The former Speaker of the House of Commons and now Labour peer warned that she thought a Jeremy Corbyn wing the Labour leadership elections would be disastrous for the party. This on the same day the Met Office learned its 80 years of providing the BBC with its weather reports were coming to an end as their contract will not be renewed when it expires. 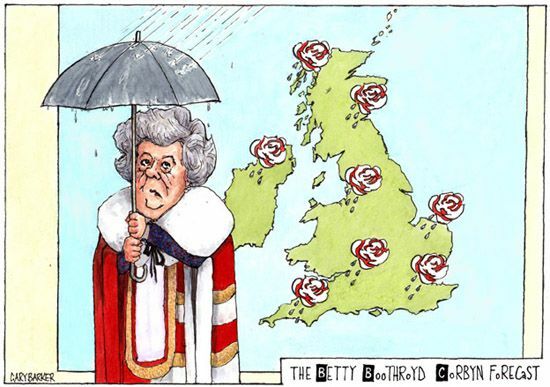 Baroness Boothroyd stated she hoped people would throw their support behind what many would describe as a more moderate candidate, but what others may see as a more a right wing option. Jeremy Corbyn eventually won the leadership race and was immediately subjected to the full onslaught of media hammering many predicted would happen. But he is proving very popular with many, not only in the Labour Party but also with those outside an party who are fed up of just hearing a one-sided view from both major parties.